Sometimes you know you have a winner if that’s the one pair of headphones that you keep reaching for. I find the MS301 a very easy to use pair of headphones. It is comfortable. It sounds good. The MS301 comes in an attractive, large box with gold graphics on a matte black background. The inside plastic that carries the headphone is of average quality. A USB cable and a 3.5mm audio cable packed inside another matte black box completes the package. The fact that they enclosed the cables inside another box makes for a much better presentation. Some cheaper Asian branded headphones just leave the accessories randomly flowing in the underside of the plastic container. This is the best and worst part of this pair of headphones. On the plus side, it supports AptX. I connected my 2017 MacBook Pro to it via bluetooth running AptX. This has to be the connection method of choice. The bad part about the MS301’s bluetooth does not support any sort of multi-point connection. It seems to only pair with one device at a time. I have to re-pair the headphones when I switch between devices. So if you are planning to use it for both say a laptop and a mobile phone, this is not the headphone for you. Range for this headphone is mediocre. I get 20 feet line of sight maximum. The MS301 has a reasonable flat response, with a slightly boosted base. This is important for me as I listen mostly to jazz and classical where good vocals are important. I ran it through my standard set of tracks. Starting with Eric’s Song by Vienna Tang, The Waking Hour: This is a simple track with Vienna’s silky vocal singing along a piano. I can hear all of the nuances of her voice interlaced with the piano. Switching over to Exit Music (For a Film), by Radiohead, OK Computer: Changing from Tang’s female vocal to the booming vocal, with a multi layer supporting vocals and instruments. All the audio tracks are still coming through cleanly. The bass is slightly boosted but not over powering the vocals. For fun I always then play Exit Music (For a Film) by Brad Mehldau, The Art of the Trio, Vol. 3: — the Jazz original. This is a very different style of course. The piano is front and center with various percussions building up around it. Sound stage is good with this pair of headphones. Changing style complete I went to Trust by Christina Perry, Head or Heart. The rocking bass line is strong but not overly boosted. A similar track: Viva La Vida by Coldplay plays equally well. What I love about these full size headphones is that the battery last a very long time — too long to test accurately. I manage to test my pair of MS301 over an entire week before I have to recharge it. All the controls for the headphone is on the right, with a power button/pause/call near the top, and volume up/forward, volume down/backward button pair down near the bottom. A small multi-color LED near the power button shows you the status of the headphone. I find that occassionally I hit the power button by mistake because it is near the top. One time it initiated a redial on my phone (pressing the power button twice) because I was trying to turn up the volume. This pair of headphone is very comfortable. The ear cups have soft foam covered by a soft synthetic leather material. For my medium size ear it covers my ear completely without too much clamping force. The headband is also padded. The entire ear cup swivel 90 degrees to the back (For folding flat) and forward by 45 or so degrees. The hinge construction seems to be mostly metal. These Asian branded headphone keeps getting better. 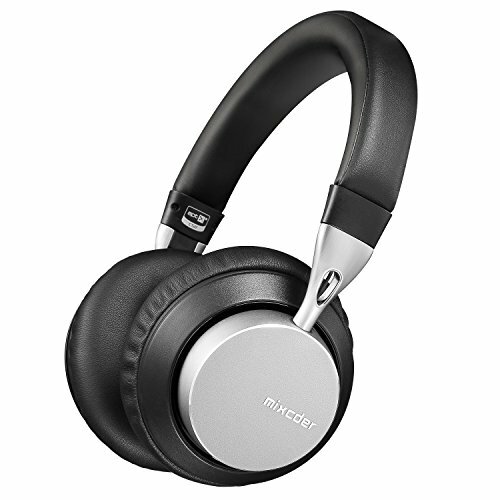 I have reviewed several pairs of mixcder headphones over the years and each new pair is better. The MS301 sounds good, looks great and is comfortable. The retail prices are getting closer to the $100 mark so it has more competition. The comfort, AptX support, and long battery life gives it a big advantage. Note: A free review unit is provided to me by the distributor. All opinions are my own.